A Reward Challenge kicks off this week's episode where only two member of each tribe get to compete for the prize of iced coffee with all the fixins (including some unnamed Milano Cookies but we all know a Milano when we see it). 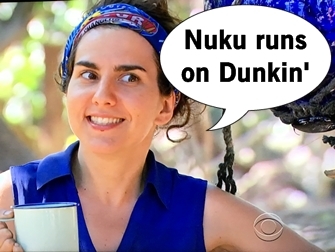 The twist is only two members from each tribe compete, and after Nuku wins first, Brad Culpepper smokes Troyzan in tossing beanbags at pins. It's bad for Troyzan because it only heightens his placement at the bottom of the tribe, but in good news Tavua has human/fish hybrid Ozzy who catches a stingray for dinner. Nuku celebrates their victory together, savoring each bite of the Milano cookies, but the scheming quickly picks back up. JT and Malcolm bro out together and wonder if they could amass the numbers to get out the two-time queen Sandra. But things all change at the Immunity Challenge when Probst announces only one tribe will have immunity and the other two tribes will go to Tribal Council. Nuku has a major lead but Jeff Varner can't finish the balancing puzzle, allowing Tavua to sneak in and win immunity.. Mana and Nuku will be attending Tribal Council tonight but another twist: they're attending together and only one person will be voted out. 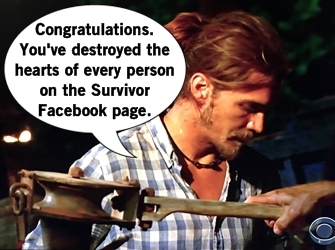 It's a Thunderdome Tribal Council: two tribes enter, one man will leave. Both tribes return to their respective camps to begin pondering their strategy. Sandra wants Nuky to vote six-strong for Sierra Dawn Thomas who is Mana's strongest female (and maybe because they share the same "SDT" initials). While Malcolm wonders if he could be the target, him and JT assume that Brad will target Sandra. That's correct, but Mana has only five members and would require one current Nuku member to flip. Then Tai finds a Hidden Immunity Idol, and everything changes as long as Mana can play the Idol right. Tribal Council time! Strategy is quickly brought up since this is a whole new twist on the game, but also each person has a different agenda. Both tribes thought out all the different scenarios of idols, targets, etc. and it promises to be a messy evening. JT is at the forefront of Tribal Council since he was formerly a Mana man but recently swore himself loyal to Nuku. Hali's in a similar position and at one point says they should target a physical threat, which kicks off a whisper session as everyone tribes to deduce Hali's intent. Suddenly, JT gets off his damn stump and walks over to Brad and tells him Nuku's plan to vote out Sierra. Then Hali gets up and tells Sandra they have to vote for Brad. And then everyone gets up into group huddles like they're pondering taking the Double Dare Physical Challenge. 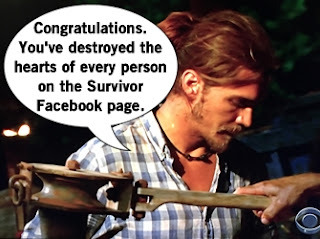 This key piece of information JT shares with Brad is enough to change the game: the immunity idol is played for Sierra, nullifying all votes cast against her. The Sierra null votes come pouring out of the urn, which means after six votes the identity of tonight's boot will be revealed. In a major blindside only hinted at earlier in discussions, Mana successfully targets and eliminates Malcolm from the game.